Whether you are an avid biker, a daily commuter, or just like to scoot around town, we have the right policy to suit your needs. 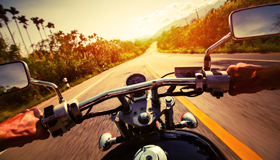 Every biker needs the basics, like Bodily Injury, Property Damage Liability, and Uninsured motorist coverage, to get out on the road. Comprehensive coverage protects your bike from non-collision covered losses, including vandalism and theft. Collision coverage ensures that your bike will be put back together if there is damage in an at-fault accident. Additional Accessory coverage covers up to $30,000 worth of custom parts and equipment. Disappearing Deductibles lowers your Comprehensive and Collision deductible by 25 percent for each claim-free policy period. Roadside Assistance gives you help on the spot, or gets you a tow to the nearest repair shop, at no out-of-pocket cost. Transport Trailer coverage gives you up to $10,000 worth of Physical Damage coverage for your trailer. Trip Interruption coverage will give you up to $500 for lodging, transportation, and food while your bike is in the shop, if you are more than 100 miles away from home.